​lasts 2 years ... in bottle ... this is the absolute best. 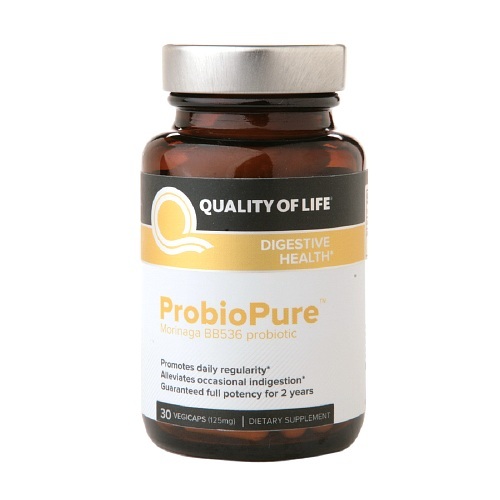 ​Quality of Life Labs ProbioPure Morinaga BB536 Probiotic, Veggie Caps 30 ea. Probiotic with BB536® is the ideal travel companion! For anyone vacationing abroad, "traveller’s diarrhea" is a serious concern. The intestinal bacteria we take for granted at home, can easily be compromised by unfamiliar environments, food, and water. For digestive health while travelling, take easy-to-carry, blister-packed webber naturals Probiotic with BB536. ​Bifidobacteria are the most important bacteria in the large intestine. They lower the pH of the colon, making it more acidic and inhibiting the growth of pathogens. They prevent harmful microbes from invading the small intestine where most digestion and nutrient absorption takes place, and help your body restore its natural balance of intestinal bacteria. B. longum leads the pack of bifidobacteria because of the numerous studies showing many its health benefits. Research shows that B. longum may prevent diarrhea in antibiotic-treated patients, help to reduce cholesterol, alleviate symptoms of lactose intolerance, stimulate immune function and much more. These health benefits attributed to the B. longum species clearly illustrates that this species possesses highly beneficial characteristics. Probiotic with BB536® Blister-packed provides Bifidobacterium longum BB536® – a special patented strain that has prolonged stability and exceptional biological value. BB536® is truly a shelf stable probiotic that resists digestive secretions for a successful delivery to the large intestine. ​Reach for webber naturals® Probiotic with BB536® every day for better digestive health. It's also ideal to take travelling. Microcrystalline cellulose, calcium carbonate, vegetarian capsule (carbohydrate gum, purified water, silica), vegetable grade magnesium stearate (lubricant).